Less can sometimes be more. 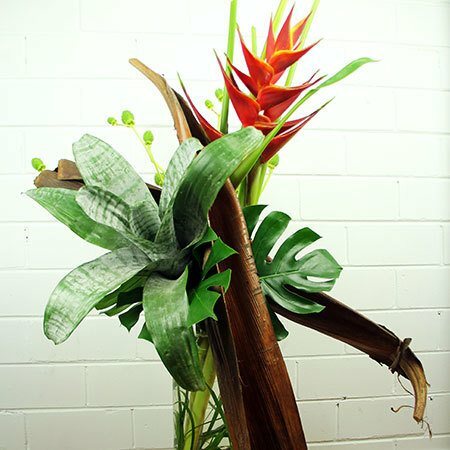 This striking, tall vase arrangement of tropical flowers for the office features long-lasting blooms and foliage, offset with sculptural branches and palm husks for an organic, yet professional look. Weekly office flower delivery can be arranged by calling 1800 66 66 46 or emailing our florists on sales@flowersforeveryone.com.au. The florist team will coordinate your office flower arrangement based on the best available blooms in-season on the day of your delivery. Colours can also be customised to suit your office decor. *Please note: Flowers for Everyone delivery office flowers throughout the Sydney metro.